The picture was painted in 1896. To date, the canvas is presented in the Moscow Tretyakov Gallery. Previously, the first version of the painting, which had the name “Sorry!” Was presented, in 1897 it was sold to an Italian woman in a private collection. In addition to it, there is also a sketch of the work, which is in one of the Moscow collections. One of Repin’s contemporaries talks about how the idea of ​​the canvas originated. He claimed that the work was presented to the viewer after the story of one of the court figures about the duel in which the perpetrator was mortally wounded and shortly before his death he apologized to his opponent. The picture shows the moment after the shot, where the wounded man was surrounded by several seconds, holding hands and anxiously looking at the doctor, who was standing nearby and walking towards the dying person, but on the contrary, turning away from the opponent, lit a cigarette the winner of the duel. After the release of the work on the mass of repin collapsed mass of reviews of a very different nature. Some believed that the artist did not finish the work, thus causing a feeling of indifference to what is happening inside the episode, but there were others who claimed that they experienced genuine emotions, looking at the facial expression of the dying, empathized him. 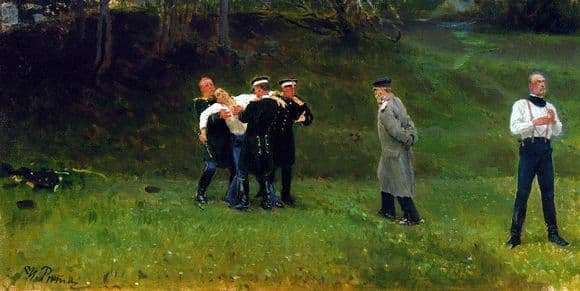 One of the critics after viewing the picture turned to Repin with the question: “After all, the wounded man forgave his killer?”. Such a reaction was unexpected for the creator, since the theme of the duel itself was contradictory. Many have considered a certain protest against duelists in their work, preferring a peaceful solution to conflict situations. The work caused a heated discussion even in the media, where it was repeatedly praised and criticized at the same time, which for the artist is an indispensable sign of mastery.